For small businesses cash is king. Cash flow ensures that a business can pay its bills and staff, keeping the business operational. That’s why the Statement of Cash Flows report is so important. It identifies the cash flowing in and out of a business, and can help you make informed decisions about how your business operates. While the Profit and Loss includes income that might not yet have been paid by your customers, the cash flow statement looks at all cash receipts and cash expenditure. It also groups the money going in and going out of your business into useful categories. Are you generating a cash surplus? Regardless of having to buy new equipment or raising money via loans, this shows you if you’re profitable. And if not, why not? Cash Flows from Investing Activities includes things such as payments for new assets like office equipment or a new company vehicle. It also includes receipts from the sale of assets, and any investments made. Cash Flows from Financing Activities shows any loan repayments, proceeds from new loans, or money invested into the business or taken out by the owners. 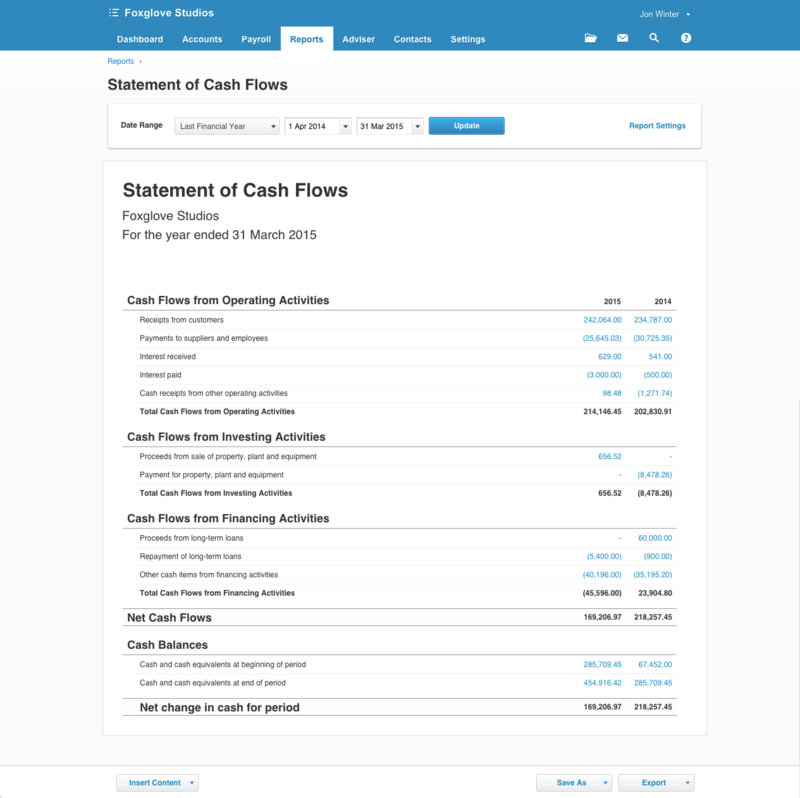 Like the new Profit and Loss report, you can modify the layout of your cash flow statement. It’s easy to lay out the order of groups and accounts on your report just the way you want. This is done using an intuitive drag and drop interface. You can also split an account into its debits and credits in the Statement of Cash Flows using the layout editor. As with all new reports, the dates are entered using a convenient date picker to quickly select common dates. To get the most from this report we recommend working with your advisor to customize the layout. This can provide a more granular breakdown of where you’ve earned and spent cash. This is useful as not every business’s chart of accounts is the same. An advisor can also help you understand the report. You can make informed decisions about how your business operates to maintain good cash flow and identify investment opportunities. Check out our Small Business Guide on managing cash flow. If you want to try this report you can find it in New Reports section of Xero Reports. 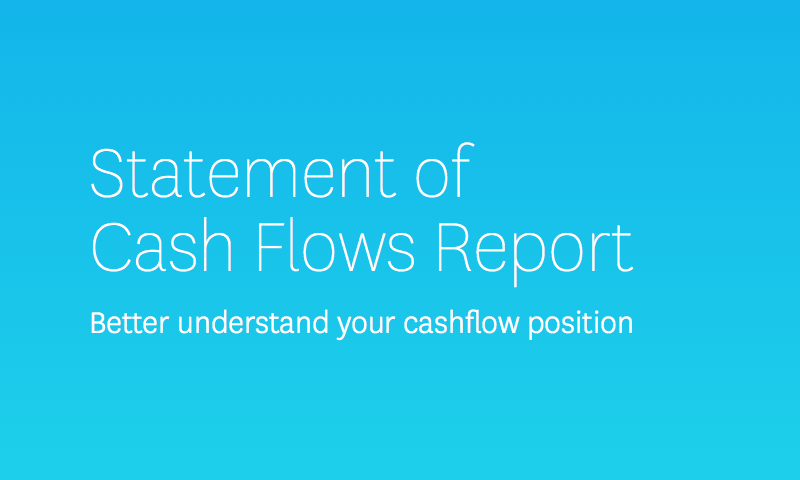 Learn more about the Statement of Cash Flow report in our help center. Please make this report GAAP-compliant! Please allow us to change which default category account transactions are posted to. Xero is currently assuming what category deposits for my client belong to, and it’s allocating them to the wrong category. For example, something which should go to ‘receipts from customers’ is being allocated to ‘cashflows from investing activities’ which is completely wrong. In MYOB you can open the chart of accounts, and for each account you can say which category in the cashflow statement entries (deposits / payments) belong. Please allow us to do this in Xero, as the template report is fantastic.